Prince Harry of the British Royal Family has come under quite a bit of fire recently for his little naked escapade in Las Vegas. In order to make up for it, Queen Elizabeth seems to be covering her entire body. 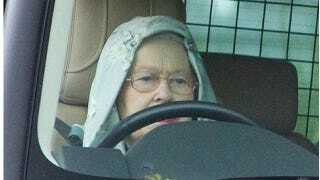 The Queen was recently spotted wearing the hoodie while driving her Range Rover after a grouse hunt. A grouse is, of course, a bird hunted by the British upperclass. Peasants like us hunt lesser birds. Some believe that she is actually wearing a scarf over her head, but we may never really know for sure. Perhaps she's auditioning for a British remake of The Wire? Stringer Queen? Why Should People Learn To Drive Stick?